This PDF 1.5 document has been generated by Microsoft® Office Word 2007, and has been sent on pdf-archive.com on 02/07/2017 at 11:32, from IP address 49.15.x.x. The current document download page has been viewed 280 times. Dr. A.P.J.ABDUL KALAM TECHNICAL UNIVERSITY. (college code 426) Sundarpur, Saharanpur NH-72 affiliated by Dr. A. P.
J. ABDUL KALAM TECHNICAL UNIVERSITY. I am unable to join such job. destroyed and I will lose everything that I want to earn for my family. 1) The Vice Chancellor, Dr.APJ Abdul Kalam Technical University. 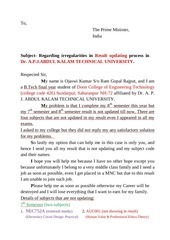 2) The Head of Examiner, Dr.APJ Abdul Kalam Technical University. This file has been shared by a user of PDF Archive. Document ID: 00618758.